A good meal starts with a good salad. If anyone were to ask the recipe to a Konkani salad....there’s just one thing that would come to mind....Ambe Saasam (Mangoes in coconut sauce). Salad!!! Yes, you read that right. Fresh cut mangoes dressed in grated coconut with a dash of salt and spice - what better on earth could be termed a true parallel to any exotic tropical fruit salad! Ambe Saasam is probably of the many ways that our Konkani ancestors came up with to enjoy and relish their harvest of mangoes. Traditionally the recipe calls for a combination of freshly grated coconut (raw), dried red chilies and tamarind to be ground together into a semi dry base that forms the dressing. Peeled and diced mangoes are then folded in with a pinch of salt to create this simple yet delectable salad. 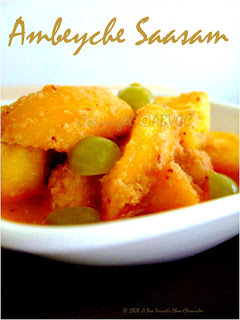 As any other Konkani recipe, the Ambe Saasam has evolved from being the regular Ambe Saasam to a more versatile Avnaas-Ambe-Saasam (Diced Pineapple and Mango in coconut sauce). Throw in a few grapes and you make it that much more of a fruit “gajbaje” (mish mash). No matter what you toss into that salad, it forever has retained the traditional name. It makes you wonder if the additions were an art developed by the home-cook to feed a huge family, especially when one specific fruit wasn’t sufficient or available in plenty. Almost every book on Konkani cuisine has given the Ambe Saasam its much deserving share of limelight. The uniqueness of this recipe is that it could be a salad – all by itself, served as ‘salsa’ or as a ’side’ with rice. Another distinctive feature about this recipe is that though termed “Saasam” – implying mustard seeds – there is very little of it that is used, compared to the coconut and chilies. It’s all of these that make it exclusively Konkani. When Dr.Tadkodkar suggested ‘Ambeyche Saasam’ for Save My Cuisine, all I could think of is summer, mangoes and more mangoes. My first introduction to Ambe Saasam was when I was little and spending summer with my grandmother in Mangalore. Every Konkani wedding I have been to, including mine, has not had a menu without Ambe Saasam! It’s interesting to see how this seasonal recipe caught on to become the most sought after, even after decades have passed by. I say that as my parents (and am sure their’s too) had Ambe Saasam on the menu at their wedding. Konkanis have taken pleasure in not only enjoying this fruit sugar and calorie loaded salad, but we have also developed a way to balance out our diet. Conventionally, this Saasam is served at lunch and less often at dinner, making it much easier on the digestive system and maintaining the blood glucose level. It’s not till you question things that we realize the value behind it! In all, Ambe Saasam is truly an exotic yet humble Konkani dish that elevates a simple meal to a banquet! Do you have an Ambe Saasam detail to share? Feel free to share your experiences and stories on Ambe Saasam. Save My Cuisine- An Introduction has helped me communicate with so many fellow Amchis around the world. I truly appreciate all your inputs and response. A special note of thanks to Roshan and Dr.Tadkodkar for their encouragement and enthusiasm to start and sustain this effort. A really mouth watering nostalgic article. Reminds of the olden days. Absolutely agree, I have fed Ambe sasame to all mixed non indian crowds and got totally mind blowing responce from them. What a surprise all the Konkani groups are using English in explaining the message,comments to konkanis. aamaka konkanintu barayilyaari jaayinaave? he groupaache naava Savemylanguage. Englishaantu baronu Konkani save karche.